ELYZIAN Hospitality has announced key promotions at East Lodge country house hotel and restaurant at Rowsley in the Peak District. Former head chef Simon Bradley becomes executive group chef and will oversee the kitchens at East Lodge and also at Callow Hall in Ashbourne, Elyzian's other Derbyshire venue. Simon trained as an apprentice chef at the Ritz in Paris before working under Raymond Blanc, perfecting his skills at two Michelin star-rated le Manoir aux Quat' Saisons. Simon has also worked alongside the BBC's Great British Menu critic, Oliver Peyton. He recently gained East Lodge its prestigious triple Rosette status from the AA, placing the restaurant in the top 10 per cent in the UK. Stepping into Simon's boots as head chef is Ben Wilkinson. A key member of the East Lodge kitchen brigade, Ben has worked his way up to the position of head chef under Simon's guidance. 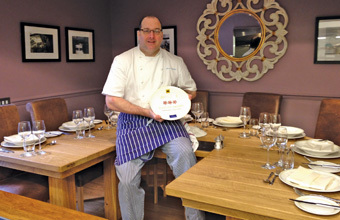 As sous chef, he was a crucial member of the team as East Lodge gained its triple Rosette status last year.